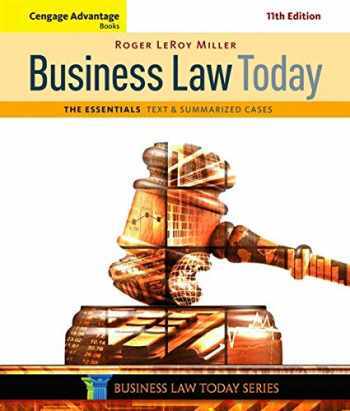 Acknowledged author Roger LeRoy Miller wrote Cengage Advantage Books: Business Law Today, The Essentials: Text and Summarized Cases comprising 888 pages back in 2016. Textbook and etextbook are published under ISBN 1305574796 and 9781305574793. Since then Cengage Advantage Books: Business Law Today, The Essentials: Text and Summarized Cases textbook received total rating of 4.5 stars and was available to sell back to BooksRun online for the top buyback price of $66.49 or rent at the marketplace. Interesting, clear, and applied, BUSINESS LAW TODAY, THE ESSENTIALS: TEXT AND SUMMARIZED CASES, 11E is your concise guide to the law and what it means in the business world -- from contracts and secured transactions to warranties and government regulations. Easy to understand with an engaging writing style that is matched by vibrant visuals, BUSINESS LAW TODAY: THE ESSENTIALS includes coverage of contemporary topics that impact not only the business world, but also your own life. Examine the financial crisis and its impact on business law or identity theft, immigration law or diversity issues. Fascinating features and intriguing cases highlight the practicality of the concepts you are learning. Numerous learning support resources provide tools that address various learning styles.